Simple... But only at first sight! 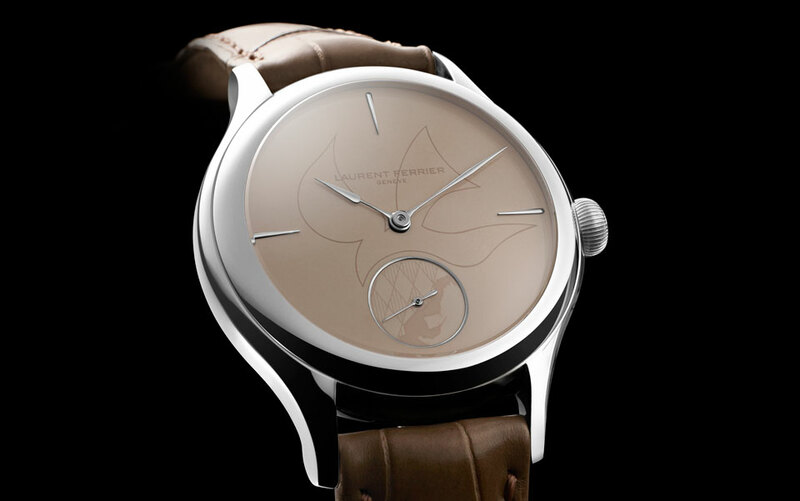 Laurent Ferrier watches are often defined as “simple”. Well, at least when it comes to the design. But when a 3-hand watch is fitted with a tourbillon double hairspring or a natural escapement (direct double impulse) and a micro-rotor, you can’t be labelled “simple” anymore. 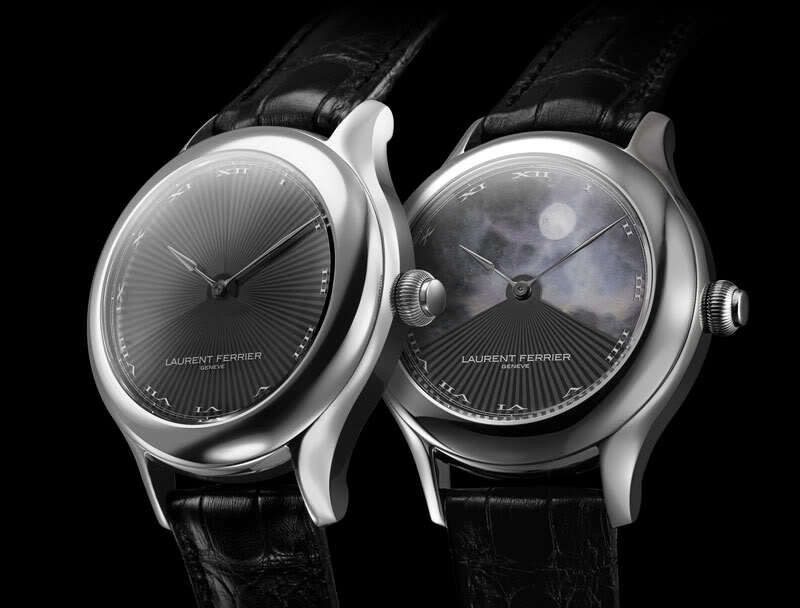 With its latest creation, the most complex in the collection so far, Laurent Ferrier doesn’t break its habits. 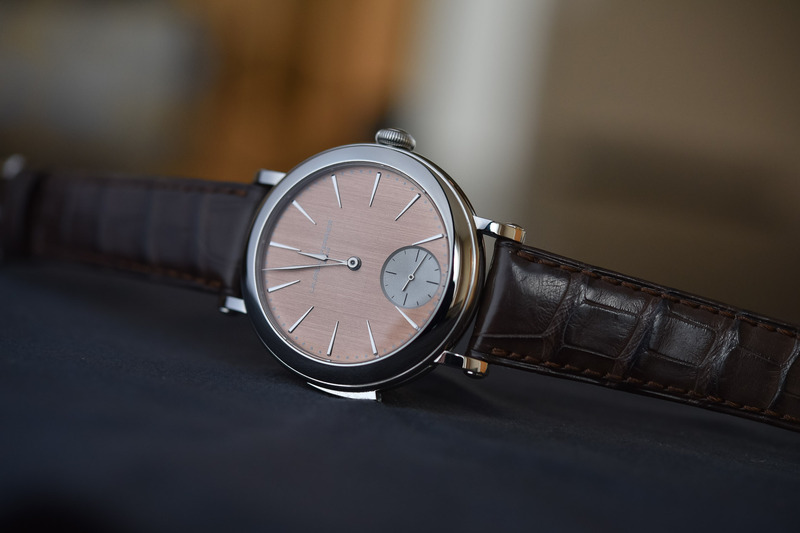 Meet the impressively clean Laurent Ferrier Galet Minute Repeater. Unveiled in the frame of Baselworld 2018, Laurent Ferrier expands its collection with the most complex piece so far. After a superb tourbillon, complex 3-hand watches (Galet, Galet Square and Montre Ecole), a traveller’s watch and an annual calendar, the small Geneva-based atelier adds what is certainly the ultimate complication for a classic-style brand, a minute repeater. The expansion of the collection is rather impressive these days, with various new movements and multiple new designs. And while I’m craving a Ferrier-designed in-house chronograph – one of those vintage-inspired hand-wound movements would be so nice on a sector dial Galet watch – the minute repeater is an achievement for the brand, next to the tourbillon. Being a brand with classics in mind – design and complications are inspired by 19th-century pocket watches – the minute repeater was a natural evolution for Laurent Ferrier. Alongside the tourbillon, the perpetual calendar and the chronograph, the chiming watch is a must-have for a brand that intends to play in the “Haute Horlogerie” league. Not only is it a technical achievement, but it is also a flagship model, a statement piece that gives more credibility to the simpler watches found in the rest of the collection. Not that LF had anything to prove, but now it has one of the true horological masterpieces to offer. There’s no doubt about this new watch’s pedigree. 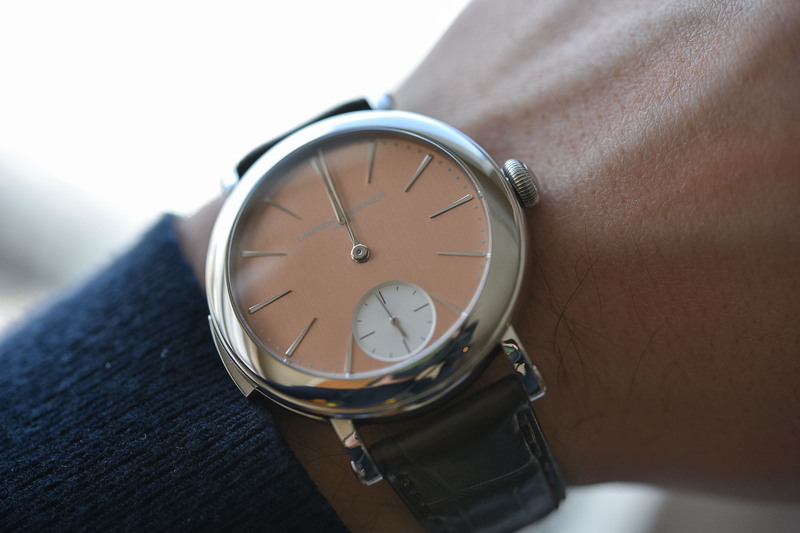 It is fully, entirely a Laurent Ferrier. Design-wise, it is based on the Montre Ecole case and takes advantage of this recently introduced shape to offer something elegant, discreet and simple – at least at first sight. Certainly, the proportions have changed to make some room for the new and more complex movement. For instance, the thickness is now 14.20mm instead of 10.95mm for the 3-hand micro-rotor version of this watch. However, the diameter remains the same, with a reasonable 40mm dimension. 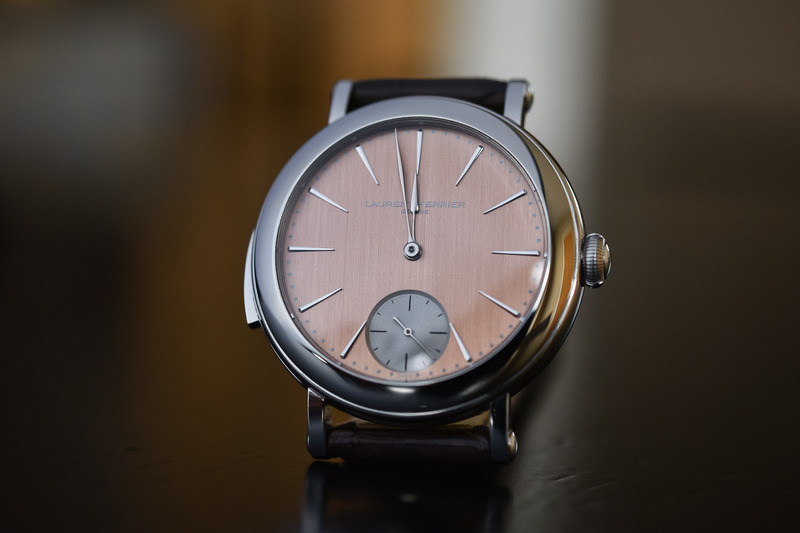 This Laurent Ferrier Galet Minute Repeater, as all watches based on the Montre Ecole case (this includes the Annual Calendar), is simple only at first sight and its shape appears to be more complex when looked at with more attention. The case is a so-called bassiné (meaning basin). All round and polished, with rounded casebands, it features subtle brushed bands on the side and nicely shaped lugs – which feel added to the case, like a converted pocket watch. When the watch is worn, especially if slightly hidden under a shirt cuff, it is one of the most unpretentious pieces you can imagine. Only a trained eye will see that it isn’t your average time machine. 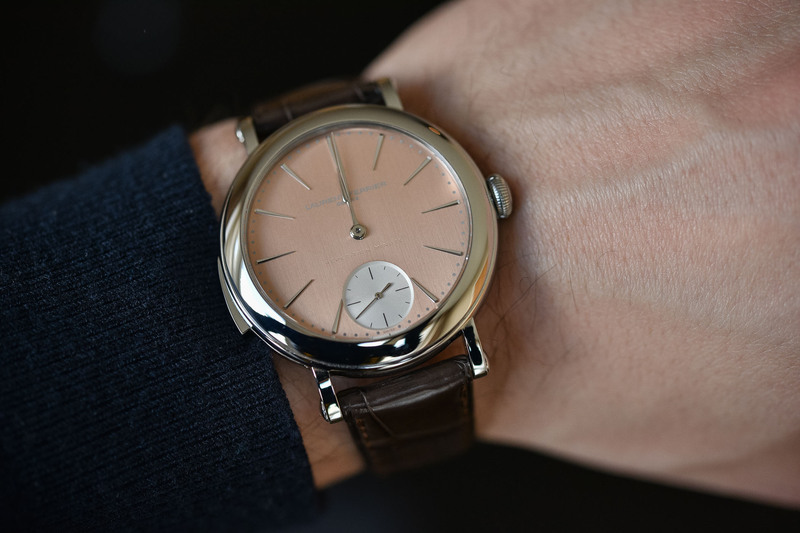 Good point: non-watch-aficionados won’t notice this Laurent Ferrier Galet Minute Repeater. The only element that gives away the prestigious pedigree of this watch is the trigger on the left side of the case, used to actuate the chiming complication. The rest is pure, clean and soft. Even the material chosen for this watch – stainless steel – is everything but a show-off material. There’s a technical reason behind this choice that we’ll explain in the second part of the article. 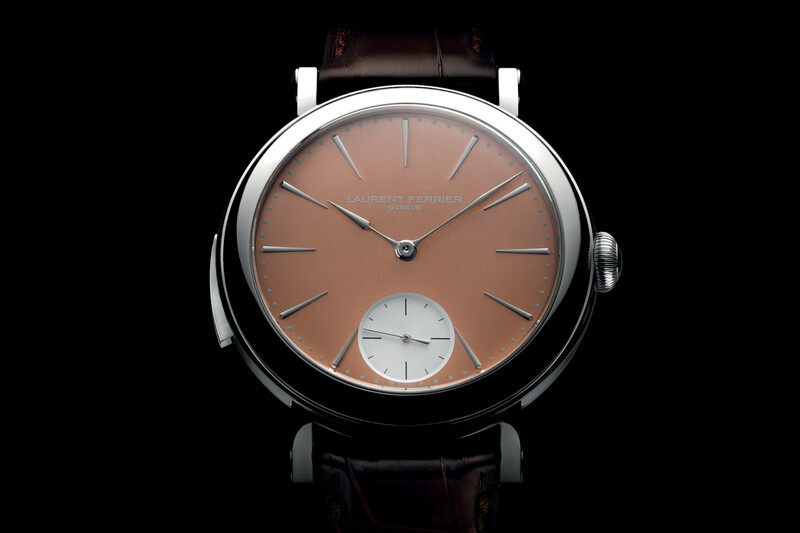 Dial-wise, the same can be said about the Laurent Ferrier Galet Minute Repeater. The simplicity of the design, a slight vintage touch and great attention to details are revealed on closer inspection. As usual, this new watch takes the classic 3-hand style of the brand with small seconds at 6 o’clock and central hands for the hours and minutes. The dial is nicely brushed, bringing a lot of depth and reflections. No useless literature, except the LF logo and “REPETITION MINUTE” engraved above the sub-dial. 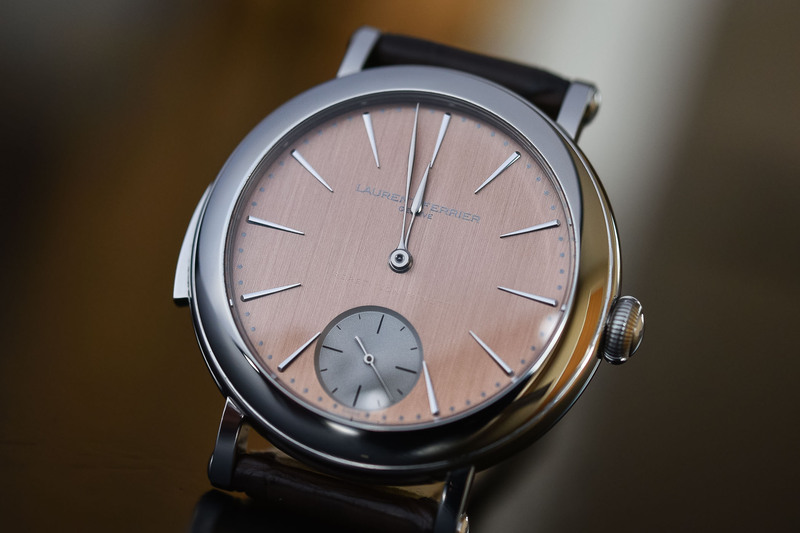 While the Laurent Ferrier Galet Minute Repeater is visually sleek, it is much more exuberant on the movement side. 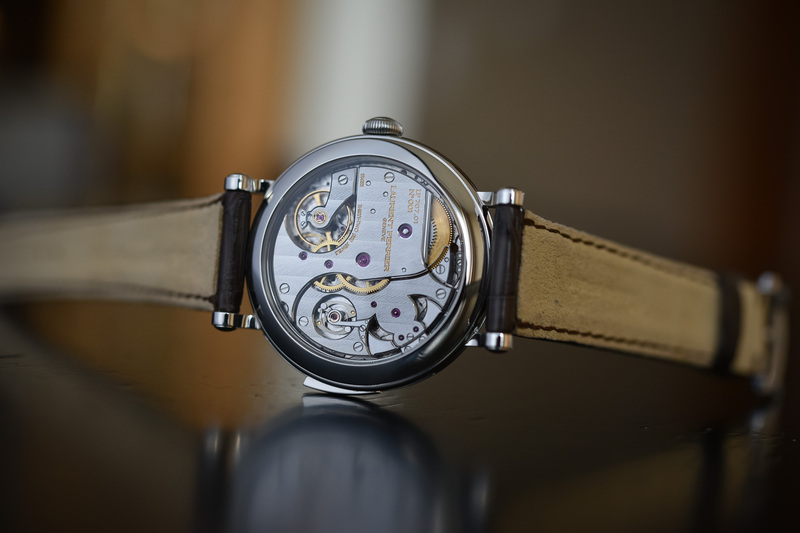 Inside is a minute repeater movement, one of the finest complications possible – and one of the most complex to assemble and adjust requiring several manual interventions for both the assembly and the tuning of the sound. 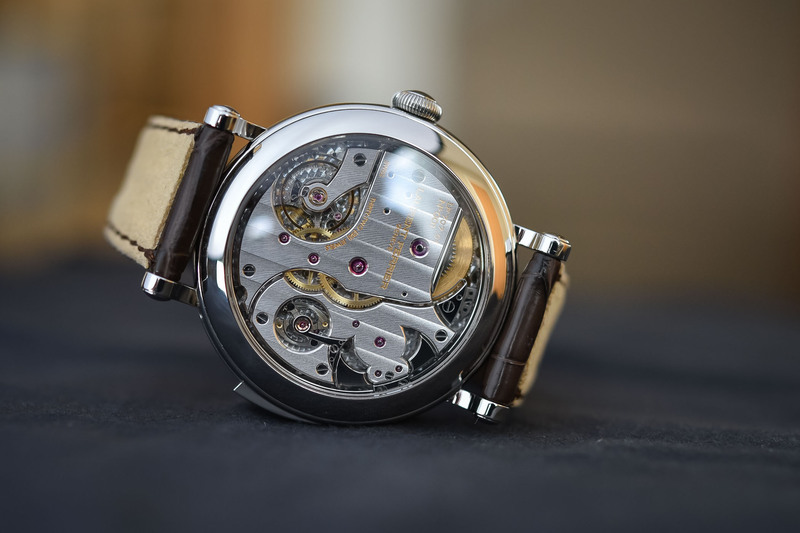 Despite the “manufacture” name of the movement, what ticks inside the case of the Galet Minute Repeater isn’t an exclusive calibre, developed and manufactured by Laurent Ferrier. The Calibre LF707.01 is based on an ébauche by La Fabrique du Temps – a movement that has been used, among others, in the Girard-Perregaux 1966 or in a Ralph Lauren watch. What’s our take on that? There’s nothing wrong in having an outsourced movement when it is known to be a good base and when it is tailored to the extent of LF’s watch. The base might be familiar but the movement is almost unique in multiple aspects. Finally, developing such a movement for a limited production of five watches would be commercially impossible. Debate closed. As mentioned, the movement is from La Fabrique du Temps, a renowned movement developer owned by Louis Vuitton and whose founders are former employees of Patek Philippe (not the worst background, thanks SJX for mentioning this), just like Laurent Ferrier himself. While the overall layout of the movement is retained – gear train, chiming mechanism – the overall design and some technical solutions have been customised to fit with other LF signature movements. This means that, for instance, the barrel isn’t secured by a click but by a blade-shaped winding pawl just like in the tourbillon double hairspring. The bridges are also entirely new and exclusive to the brand. They are shaped in LF’s traditional way, with one large bridge full of curves and angles, covering most of the parts. The important technical elements are left visible though, for instance, the escapement (a standard Swiss lever escapement and not a natural escapement) or the striking mechanism (gongs, hammers and governor). One superb detail is the small bridge holding the governor, shaped like a musical note. The decoration and finishing are in line with the rest of the brand’s production, with large hand-made Geneva stripes, polished countersinks around the rubies, manually polished anglages with sharp angles, black-polished steel parts and bevelled wheel spokes. Extremely well executed but rather discreet. 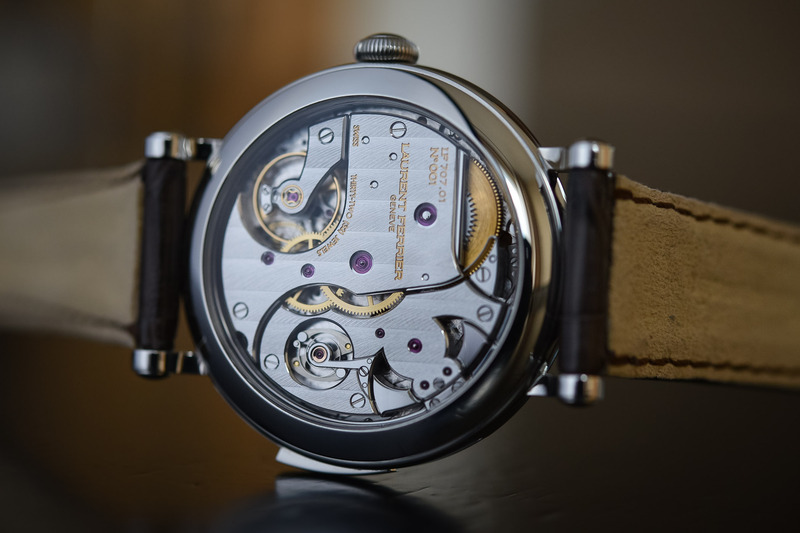 The rest of the movement features a free-sprung screwed balance beating at 3Hz and an 80h power reserve. As for the sound, the Laurent Ferrier Galet Minute Repeater is calibrated this way: D sharp for the hours, F sharp for the minutes. The choice of stainless steel was obvious for this watch. Even though it is a more common material, steel (as well as titanium) has excellent musical properties and a better transmission of sound than gold or platinum – which are denser. 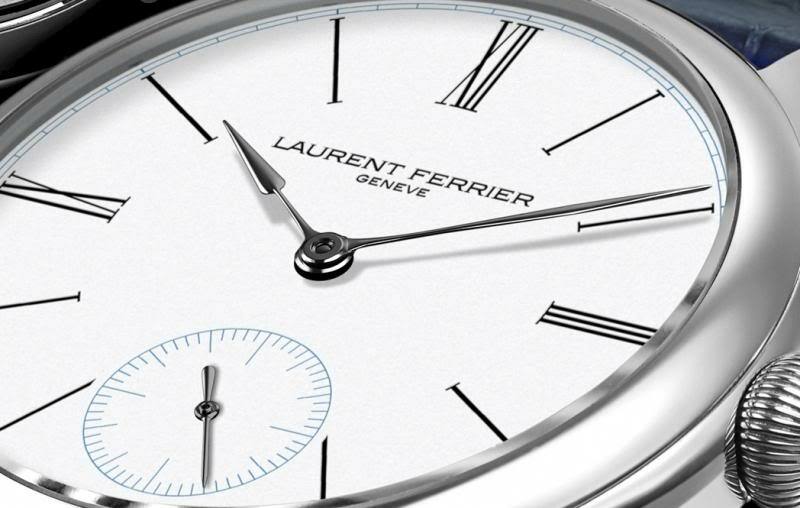 As a result, the Laurent Ferrier Galet Minute Repeater has a bright and clear sound. 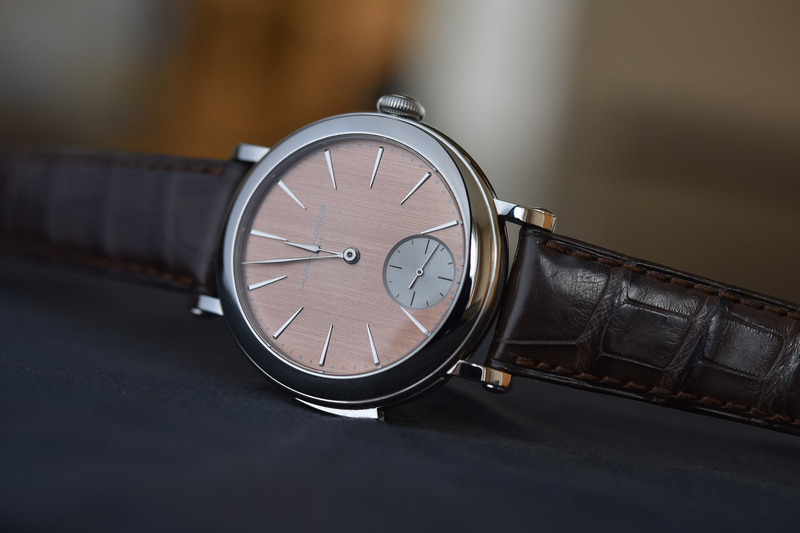 To conclude, this first minute repeater by Laurent Ferrier is an impressive watch: extremely discreet, superbly executed with multiple details that only reveal themselves after closer inspection, a steel case that helps the movement to sound great… The Laurent Ferrier Galet Minute Repeater will be produced in five pieces only, over the next two years. It is priced at CHF 290,000. 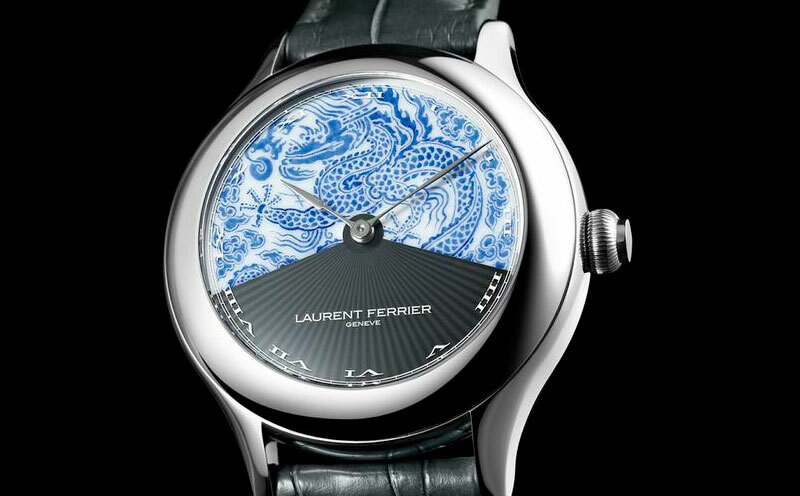 More details on laurentferrier.ch. Without a chiming video is really a pity!